Sister Sledge is an American musical group formed in 1971, and originally consisted of sisters Debbie, Joni, Kathy, and Kim. Known for their work with Chic in the late-1970s, Sister Sledge reached the height of their popularity during the disco era. The group was formed in Philadelphia, Pennsylvania in 1971, when their ages ranged from 12 to 16. They recorded their first single, "Time Will Tell," for the Philly-based 'Money Back' label. 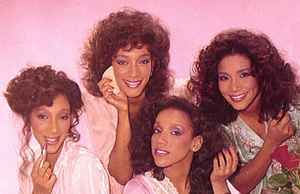 For the first few years, the group called itself Sisters Sledge. In 1972, Sister Sledge signed with ATCO Records and recorded its second single, "Weatherman," which was followed by The Jackson 5-like "Mama Never Told Me" in 1973. It wasn't until 1979, when Chic leaders Nile Rodgers and Bernard Edwards produced "We Are Family", that Sister Sledge really exploded commercially. "He's the Greatest Dancer" and the album's eponymous single both reached number one on the R&B charts, in the US. In 1989, Kathy left the group to pursue a solo career. Joni passed away on 10th March 2017.